Located along the ocean, adjacent to Agate State Beach, this Newport Oregon hotel features an indoor pool and a restaurant. Select rooms feature ocean views. Free Wi-Fi is offered in all rooms. Styled in contemporary furnishings and white linens, each room offers room service and provides a spacious en suite bathroom. 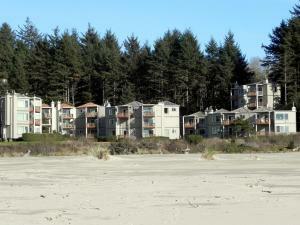 A microwave and a refrigerator are also provided at Best Western Agate Beach Inn. After a day at the beach, guests can enjoy the hot tub onsite. 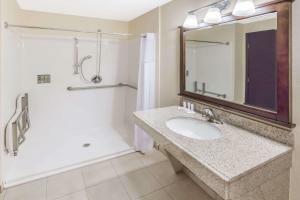 A fitness centre and a business centre are also offered at Agate Beach Inn Best Western. Sea Glass Bistro & Lounge, the on-site restaurant, is open for breakfast, lunch, and dinner. The menu features coastal-inspired traditional cuisine. Oregon Coast Aquarium is 4 miles away. Yaquina Bay Lighthouse is 5 minutes’ drive away from Best Western Agate Beach Inn. When would you like to stay at Best Western Plus Agate Beach Inn ? Featuring an ocean view, this room offers free Wi-Fi and an en suite bathroom. Tea and coffee-making facilities, a microwave and a refrigerator are also provided. This room offers free Wi-Fi and an en suite bathroom. Tea and coffee-making facilities, a microwave and a refrigerator are also provided. This pet-friendly room offers free Wi-Fi and an en suite bathroom. Tea and coffee-making facilities, a microwave and a refrigerator are also provided. Featuring an ocean view, this pet-friendly room offers free Wi-Fi and an en suite bathroom. Tea and coffee-making facilities, a microwave and a refrigerator are also provided. Featuring a partial ocean view, this room offers free Wi-Fi and an en suite bathroom. Tea and coffee-making facilities, a microwave and a refrigerator are also provided. Featuring a hillside view, this room offers free Wi-Fi and provides an en suite bathroom. Tea and coffee-making facilities, a microwave and a refrigerator are also provided. Extras include a hillside view. Featuring an ocean view and 1 queen bed, this room offers free Wi-Fi and an en suite bathroom. Tea and coffee-making facilities, a microwave and a refrigerator are also provided. This accessible room offers free Wi-Fi and provides an en suite bathroom. Tea and coffee-making facilities, a microwave and a refrigerator are also provided. Extras include a hillside view. Featuring an ocean view, this room offers free Wi-Fi and provides an en suite bathroom. Tea and coffee-making facilities, a microwave and a refrigerator are also provided. Extras include a hillside view. Featuring a partial ocean view, this room offers free Wi-Fi and provides an en suite bathroom. Tea and coffee-making facilities, a microwave and a refrigerator are also provided. Extras include a hillside view. This room offers free Wi-Fi and provides an en suite bathroom. Tea and coffee-making facilities, a microwave and a refrigerator are also provided. Extras include a hillside view. Please note: A security deposit is required upon arrival for incidentals. This deposit is fully refundable upon check-out and subject to a damage inspection of the accommodation. Guests are required to show a photo identification and credit card upon check-in. Please note that all Special Requests are subject to availability and additional charges may apply. Each day we'll check prices and send you an email for your selected dates at Best Western Plus Agate Beach Inn. If you don't have specific dates but would like to check prices for say next weekend or say next month we can check the price too. Click to write a review and share your experience of Best Western Plus Agate Beach Inn with other travellers.